Jason David Kander (born May 4, 1981) is an American attorney, author, veteran, and politician. A Democrat, he served as the 39th Secretary of State of Missouri, from 2013 to 2017. He had previously served as a member of the Missouri House of Representatives from 2009 to 2013. Before entering politics, he was an intelligence officer in the Army National Guard, achieving the rank of captain. He was the Democratic nominee for the United States Senate for Missouri in 2016, narrowly losing the election to Republican incumbent Roy Blunt. After the Senate election, Kander founded an organization called Let America Vote, a campaign dedicated to ending voter suppression. He declared himself a candidate in the 2019 Kansas City mayoral election, but dropped out on October 2, 2018, after revealing that he suffered from PTSD and depression. Kander was born on May 4, 1981 in Overland Park, Kansas, the son of Janet (née Secor), a juvenile probation officer, and Steve Kander, a police officer who later ran a small business. His father is Jewish, and Kander himself was brought up in a Jewish household which he describes as "Reform but not very observant." He was raised in Shawnee, Kansas with his younger brother, Jeff, and several troubled children that his parents fostered. He graduated from Bishop Miege High School in 1999, where he had been a member of the debate team. He then attended American University, where he studied political science. After the September 11 attacks, he enlisted in the Army National Guard. While earning his law degree at Georgetown University, he earned his commission as a second lieutenant through the University's ROTC battalion. After completing his law degree in 2005, he volunteered for a tour in Afghanistan, where he served as an intelligence officer. While serving, his main responsibilities included investigating groups and individuals suspected of corruption, espionage, drug trafficking, and facilitating Al Qaeda and the Taliban. 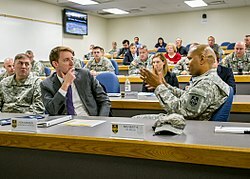 When he returned home, Kander took a position as an instructor at the Missouri Army National Guard's Officer Candidate School at Fort Leonard Wood, where he taught hundreds of soldiers leadership skills in combat. He also worked as an adjunct instructor in political science at the University of Missouri–Kansas City, and as an attorney at local law firms. In 2010, he was named one of ten finalists for the Army Reserve Association's Major General Strom Thurmond Outstanding Junior Officer of the Year Award. He was honorably discharged at the rank of captain in 2011. Heartland Democrats of America (HDA) was a political action committee founded in 2005 in Kansas City, Missouri by Kander and his wife, Diana. He served as the treasurer until 2007. HDA raised over one hundred thousand dollars from special interest groups and individuals in support of Democratic candidates and causes. Notable supporters included current and former state and city elected officials, along with national figures, such as Terry McAuliffe, the former Democratic National Committee (DNC) chairman and former Virginia governor; George Lakoff, an author and professor at the University of California, Berkeley; John Halpin, a senior fellow at the liberal Center for American Progress; and Mark Talisman, an author, Democratic activist, and president of the Project Judaica Foundation. HDA's mission was to "recognize the need for Democrats to engage in, expand, and ultimately win the 'values debate.' HDA members understand that progress cannot wait for the next campaign season, because Democrats need to start changing minds now. HDA champions strong Democratic values in Missouri and throughout America's Heartland. The era of the apologetic Democrat in middle America is being laid to rest forever – replaced by a unifying values message worthy of the hard-working people of middle America." HDA was officially terminated in 2008. Kander was elected to the Missouri House of Representatives in 2008, representing the 44th district. He easily defeated two other Democrats in the primary election, but was unchallenged in the general election. Serving on the Budget Committee, he fought against no-bid contracts and worked to pass balanced budgets without raising taxes. He helped pass legislation strengthening Missouri's human trafficking laws, as well as a law that enabled authorities to prevent kidnappings during custody battles. In addition to his legislative duties, he was appointed in 2009 to serve on the Missouri Veterans Commission, which oversees all services for the state’s veterans. In 2010, Kander worked with Republican State Representative Tim Flook to pass the first major ethics reform bill in Missouri since 1991. Later that year, he ran for re-election to his State Representative seat and won 69.6% of the vote to defeat Republican Sally Miller. During his time in the Missouri House, Kander was the chief sponsor of 28 bills, none of which became law. Kander announced his candidacy for the Missouri Secretary of State after Robin Carnahan announced she would not seek reelection. He defeated MD Rabbi Alam in the primary election, winning the Democratic nomination. In the general election, Kander faced the Speaker Pro Tempore of the Missouri House, State Representative Shane Schoeller. Schoeller ran on a platform of implementing stricter voter identification rules. By contrast, Kander opposed harsher voter identification rules, instead focusing on reforming the state's campaign finance laws. On November 6, 2012, Kander narrowly defeated Schoeller and was elected Missouri Secretary of State. At 32 years old, he was the youngest statewide elected official in the nation at the time, as well as the first millennial. While in office, Kander made ethics reform one of his top priorities. He admitted this could be "an uphill battle' given that Missouri has had some of the weakest ethics laws in the country and Republicans had supermajorities in both chambers of the state legislature. "I am realistic about the fact that it is not easy to get any legislative body to police itself. There is no interest group in Jefferson City called Big Ethics. I just remind legislators of both parties that this is something that the public expects of all of us," he said in 2014. On February 19, 2015, Kander entered the race to represent Missouri in the United States Senate against Roy Blunt, the Republican incumbent. He won the Democratic primary against three other candidates on August 2, 2016. During the campaign, he positioned himself as a Washington, DC outsider and touted his experience as an Army Intelligence officer. He accused Blunt of being well connected to DC lobbyists (Blunt's wife and three children are in fact lobbyists). Blunt in turn accused Kander of being too liberal. In September, Kander's campaign received national attention when it released an advertisement explaining his support for gun control measures. Titled "Background Checks", it showed him assembling an AR-15 rifle while blindfolded and then challenging Blunt to attempt the same thing. The advertisement quickly went viral, and as of November 2016, the original YouTube video had earned more than 1.3 million views. Initially, Kander was well behind in the race, but polls started to show a tightening in the fall. In response to this, Blunt campaign began attacking Kander for being a national co-chair for presidential candidate Hillary Clinton. During the campaign, Kander received endorsements from Americans for Responsible Solutions, Daily Kos, the League of Conservation Voters, Planned Parenthood Action Fund, and the Sierra Club. Kander was narrowly defeated by Blunt in the general election, receiving 46.4% of the vote to Blunt's 49.2%. In spite of the loss, Kander received the most votes of any Democrat running statewide in Missouri that year, outperforming Clinton, gubernatorial candidate Chris Koster, and other Democrats. On June 25, 2018, Kander announced that he will run for mayor of Kansas City in 2019 to replace term-limited incumbent Sly James. Prior to his announcement, Kander had been repeatedly mentioned as a possible contender for the Democratic nomination in the 2020 U.S. presidential election. Speculation about his presidential ambitions had been fueled by his frequent visits to the early primary states of Iowa and New Hampshire, and Kander himself had suggested he would consider exploring a bid after the 2018 midterm elections were finished. His campaign for mayor effectively put that speculation to rest. Kander dropped out of the race on October 2, 2018, citing symptoms of PTSD and depression. He also announced that he would be stepping away temporarily from his work with Let America Vote as he receives treatment. In 2017, Kander became a CNN contributor. He hosts the Crooked Media podcast Majority 54 with Jason Kander, where he and his guests explore how Democrats can talk about divisive issues with people who voted for Donald Trump. In 2018, he authored his first memoir Outside the Wire: 10 Lessons I've Learned in Everyday Courage, reflecting on his time in the military, to launching his first political campaign, to where the Democratic Party should go following the 2016 U.S. presidential election. Kander has also lent his support to other Democrats running for office, such as Jon Ossoff, Phil Murphy, Conor Lamb, Stacey Abrams, and Kyrsten Sinema. Let America Vote is a political action organization founded by Kander in 2017. Its mission is to end voter suppression and gerrymandering across the country. The group raised approximately $2.4 million in its first year. Notable members of its advisory board include human rights activist Martin Luther King III, actor Bradley Whitford, and former White House officials Josh Earnest, Jon Favreau, and Dan Pfeiffer. In his capacity as president of Let America Vote, Kander also serves as chairperson of the DNC's Commission on Protecting American Democracy from the Trump Administration. Congresswoman Terri Sewell serves as vice chair. He considers overturning Citizens United v. FEC a political priority. In addition to helping pass ethics reform while a state representative, he forbade his office employees from taking gifts from lobbyists while Secretary of State. Kander supports the Every Student Succeeds Act of 2015, which replaced the No Child Left Behind Act of 2001. For higher education, he supports capping interest rates on federal student loans and expanding Pell Grants to provide more aid to low-income students. He believes students who have graduated need to be able to refinance their loans at lower rates. Kander supports tax breaks for the middle class and closing tax loopholes for corporations. He is in favor of increasing the federal minimum wage, and for ensuring equal pay for equal work. He is supportive of adding a balanced budget amendment to the United States Constitution. Ahead of the August 7, 2018 referendum on Proposition A to adopt right-to-work laws in Missouri, Kander campaigned in opposition to the proposition. Kander is skeptical of the Iran Nuclear Deal. He is pro-Israel and has called on Congress to stop the Boycott, Divestment and Sanctions movement. In 2009, Kander voted against a bill that would have extended to renters the Castle Doctrine (a doctrine that allows a homeowner to use deadly force against a perceived intruder). The bill would have also lowered the age requirement for a concealed carry permit and would have removed a ban on carrying a gun on a college campus. The National Rifle Association gives Kander an "F" rating and spent nearly $1 million against him in 2016 (the most money against any candidate that year outside of Ohio). Kander supports improving the Patient Protection and Affordable Care Act. He has proposed changing the 30-hour workweek used to define full-time employees, allowing cheaper plans for people who do not require medical care, and repealing the long-delayed Cadillac tax. He is in favor of a public health insurance option, but also supports single-payer healthcare. He believes states should take advantage of the Medicaid expansion the law provided. Kander is pro-choice but is in favor of retaining the Hyde Amendment. Kander was critical of Republican senators who refused to meet with Supreme Court nominee Merrick Garland, citing it as an example of Washington dysfunction. He believes senators should meet with all Supreme Court nominees. Kander supports the 2015 United States Supreme Court ruling in Obergefell v. Hodges that deemed the Defense of Marriage Act unconstitutional. While a state legislator, he co-sponsored the Missouri Non-discrimination Act (MONA); the bill never became law. Regardless, as Secretary of State, he implemented a non-discrimination policy for the office's hiring practices that would have conformed to MONA had it become law. He supports passing the federal Equality Act into law. On immigration policy, Kander is supportive of the bipartisan immigration bill of 2013 that passed the Senate but was never considered by the House. He is opposed to closing the detention camp at Guantanamo Bay but also voted against a measure to prevent Missouri from housing, transporting, or providing medical care to any prisoners suspected of terrorism. Kander opposes the Trans-Pacific Partnership, believing it hurts working-class families and encourages sending jobs overseas. He is, however, in favor of modernizing the Cuban embargo to allow American farmers and ranchers to sell their goods into Cuba. Kander is against privatizing Social Security. On Medicare, he believes the government should be using its marketplace clout to negotiate lower prescription drug prices. He believes both programs can be strengthened by eliminating wasteful government spending in other sectors. On April 19, 2018, Kander was honored for his commitment to integrity in government with the James C. Kirkpatrick Excellence in Governance Award by the student government association at the University of Central Missouri. At the ceremony, he encouraged the audience to remain confident in the promise of America and to serve wherever they find the opportunity. Kander married his high school sweetheart, entrepreneur and author Diana Kander (née Kagan) in 2003. Diana and her family emigrated from the Soviet Union in 1989. The couple have one son named True, who was born in September 2013. Kander is the grand-nephew of musical composer John Kander, whose best-known works include Cabaret and Chicago. He is a distant relative of Lizzie Black Kander, author of The Settlement Cookbook. He is an avid fan of the Kansas City Royals. Kander, Jason (2018). Outside the Wire: 10 Lessons I've Learned in Everyday Courage. Twelve Books. ISBN 978-1538747599. ^ Kraske, Steve (May 12, 2015). "Missouri is no longer home to the youngest statewide official". Kansas City Star. Retrieved August 17, 2018. ^ a b "Missouri Results". The New York Times. Retrieved November 9, 2016. ^ a b Murphy, Doyle (February 7, 2017). "Jason Kander Launches Let America Vote to Fight Voter Suppression". Riverfront Times. ^ a b Turque, Bill; Vockrodt, Steve (October 2, 2018). "Jason Kander ends campaign for Kansas City mayor to focus on depression, PTSD". Kansas City Star. Retrieved October 2, 2018. ^ "A look at Mo. candidates for secretary of state". Southeast Missourian. Archived from the original on April 23, 2016. Retrieved April 12, 2016. ^ Kraske, Steve (June 30, 2015). "Missouri and Kansas campaigns are scrambling for dough as June 30 deadline beckons". Kansas City Star. ^ "Fact check: Jason Kander is a fifth generation Missourian". Columbia Daily Tribune. July 28, 2016. ^ Fleisher, Gabe (October 13, 2016). "Senate candidate influenced by Jewish upbringing". St. Louis Jewish Light. ^ Guttman, Nathan (July 3, 2017). "Does Jason Kander Have The Winning Formula For Democrats In The Heartland?". Jewish Daily Forward. Kander, 36, was born in Kansas to a Jewish father and a non-Jewish mother...Kander describes his family as Reform but not very observant. ^ a b c Canon, Scott (October 14, 2016). "Jason Kander wants you to know he's running for Senate as a veteran". Kansas City Star. Retrieved December 27, 2017. ^ @JasonKander (May 2, 2018). "1986: Me holding my brand new baby brother Jeff" (Tweet) – via Twitter. ^ Wheeler, Luke (October 12, 2012). "Stag Debate: Producing Championships and Fostering Success for Miege Graduates" (PDF). ^ a b c Ruiz, Michelle (January 27, 2017). "Who Is the Future of the Democratic Party?". Vogue. Retrieved April 30, 2018. ^ Fernholz, Tim (August 24, 2007). "From Georgetown to the frontlines". The Georgetown Voice. Retrieved November 23, 2015. ^ a b c Kass, Abby (February 12, 2015). "Entrepreneur Diana Kander left legal profession to mentor students, others". Columbia Missourian. ^ Martin, David (July 15, 2014). "Jason Kander tried to clean up Missouri politics, but the waters wanted to stay muddy". The Pitch. Retrieved January 16, 2013. ^ a b "Biography for Secretary of State Jason Kander". Missouri Secretary of State's Office. Archived from the original on January 6, 2017. Retrieved May 29, 2018. ^ Higgins, Elise (December 4, 2010). "Officer Candidate School gives Guardsmen chance to achieve goals". Moguard.com. Archived from the original on February 19, 2015. Retrieved January 16, 2013. ^ a b "Jason Kander: Fall 2017 Resident Fellow". The University of Chicago Institute of Politics. Retrieved May 25, 2018. ^ "Jason Kander's Biography - The Voter's Self Defense System". Vote Smart. August 2, 2016. Retrieved November 2, 2016. ^ Lemons, Johnathan (September 11, 2001). "Missouri National Guard Soldier Receives National Recognition". Moguard.com. Archived from the original on February 19, 2015. Retrieved January 16, 2013. ^ "Kander Military Records Redacted" (PDF). jasonkander.com. Archived from the original (PDF) on September 16, 2016. Retrieved January 25, 2017. ^ Celock, John (June 7, 2012). "Jason Kander, Missouri Secretary Of State Candidate, Makes Afghanistan Experience Centerpiece Of New Ad". Huffington Post. Retrieved February 11, 2018. ^ "Statement of Committee Organization" (PDF). Missouri Ethics Commission. Retrieved February 11, 2018. ^ "Amended Statement of Committee Organization" (PDF). Missouri Ethics Commission. Retrieved February 11, 2018. ^ "Committee Summary". Missouri Ethics Commission. Retrieved February 11, 2018. ^ "Notable Supporters". Heartland Democrats of America. Archived from the original on October 20, 2006. Retrieved February 11, 2018. ^ "Heartland Democrats of America". Heartland Democrats of America. Archived from the original on October 5, 2006. Retrieved February 11, 2018. ^ "Termination". Missouri Ethics Commission. Retrieved February 11, 2018. ^ "State of Missouri Primary Election August 2008 Primary Election" (PDF). State of Missouri. Retrieved June 22, 2016. ^ Messenger, Tony (May 3, 2010). "Steve Tilley holds the key to fate of ethics reform bill". St. Louis Post-Dispatch. Retrieved January 16, 2013. ^ "State of Missouri General Election Tuesday" (PDF). State of Missouri. November 2, 2010. Retrieved August 30, 2017. ^ a b c Bott, Celeste (October 31, 2016). "Jason Kander: a 'man on the move'". St. Louis Post-Dispatch. Retrieved November 2, 2016. ^ Kraske, Steve (January 20, 2012). "Jason Kander is quickly making his move". KansasCity.com. Retrieved January 16, 2013. ^ "November 6, 2012 General Election: Election Night Reporting: Missouri Secretary of State". Enr.sos.mo.gov. Archived from the original on October 27, 2012. Retrieved January 16, 2013. ^ Celock, John (November 8, 2012). "Jason Kander Defeats Shane Schoeller For Missouri Secretary Of State". Huffington Post. Retrieved April 24, 2018. ^ Hancock, Jason (December 4, 2012). "KC's Kander now secretary of state, and maybe on the rise". Kansas City Star. Retrieved January 16, 2013. ^ a b Wogan, J.B. (April 2014). "Jason Kander: Young, In Charge and Taking on Ethics Reform". Governing. Retrieved April 24, 2018. ^ Herndon, Rachel (February 19, 2015). "Jason Kander Announces He Will Run for United States Senate". The Missouri Times (Press release). Retrieved February 19, 2015. ^ a b Bott, Celeste (September 20, 2016). "Blunt campaign responds to Kander's AR-15 ad: 'Missouri voters know what's important'". St. Louis Post-Dispatch. Retrieved November 2, 2016. ^ "Roy Blunt the insider vs. Jason Kander the outsider sums up U.S. Senate contest in Missouri". Kansas City Star. September 24, 2016. Retrieved April 24, 2018. ^ Corasaniti, Nick (September 17, 2016). "In Missouri Senate Race, Challenger Makes His Point With a Blindfold and Rifle". The New York Times. ISSN 0362-4331. Retrieved November 6, 2016. ^ "Emerson Poll: Trump Leads Clinton Nationally; Arkansas, Georgia, Missouri Remain Red; Colorado is Leaning Trump; Pneumonia Diagnosis Appears to Be Hurting Clinton" (PDF). Media.wix.com. Retrieved November 11, 2016. ^ Vazquez, Maegan (September 15, 2016). "Blindfolded Veteran Assembles AR-15 to Make a Point About Gun Control". Independent Journal Review. Retrieved September 17, 2016. ^ "Daily Kos: Jason Kander - 2016 endorsement". Daily Kos. Retrieved September 21, 2016. ^ Blatt, Hannah (May 17, 2016). "LCV Action Fund endorses Jason Kander for U.S. Senate". League of Conservation Voters. Retrieved September 21, 2016. ^ "Planned Parenthood Action Fund endorses Missouri's Jason Kander in Senate Race". Planned Parenthood Action Fund. August 11, 2016. Retrieved September 21, 2016. ^ "Sierra Club endorses Jason Kander for U.S. Senate". Sierra Club. August 8, 2016. Retrieved September 21, 2016. ^ Vockrodt, Steve (June 25, 2018). "Kander confirms bid for Kansas City mayor in a move already shaking up the ballot". The Kansas City Star. Retrieved June 25, 2018. ^ Steinhouser, Paul (February 20, 2017). "Possible 2020 contender Kander says N.H. a 'poster child' in battle over voting rights". Concord Monitor. Retrieved March 13, 2018. ^ Scher, Brent (August 15, 2017). "With Eye on 2020, Jason Kander Gets Behind Single-Payer". The Washington Free Beacon. Retrieved November 15, 2017. ^ Wise, Lindsay; Roarty, Alex; Lowry, Bryan (June 26, 2017). "President Jason Kander? He's making all the early moves". The McClatchy Company. Retrieved November 15, 2017. ^ a b Dovere, Edward-Isaac (June 17, 2017). "How Jason Kander Won by Losing". Politico. Retrieved January 10, 2018. ^ "2020 Dem contenders travel to key primary states". The Hill. February 19, 2018. Retrieved May 30, 2018. ^ Taylor, Jason (April 27, 2018). "Former Missouri office holder calls for Greitens to leave, and his supporters to follow". Missourinet.com. Retrieved May 15, 2018. ^ Resnick, Gideon (June 25, 2018). "Jason Kander, Rumored 2020 Democratic Candidate, Instead Opts to Run for Mayor". The Daily Beast. Retrieved June 25, 2018. ^ "Politician Jason Kander Puts Down 'Alt-Right' Leader Richard Spencer Over 'Cabaret' Tweet". Variety. March 20, 2017. Retrieved April 29, 2017. ^ "Majority 54 with Jason Kander". Crooked Media. Retrieved April 23, 2018. ^ "Outside the Wire". Retrieved April 23, 2018. ^ "Jason Kander and Jon Ossoff Launch Voter Registration Drive – Jon Ossoff for Congress". May 4, 2017. ^ @JasonKander (November 2, 2017). "New Jersey friends: @PhilMurphyNJ will make an outstanding governor. Commit to vote for him on Tuesday" (Tweet). Retrieved November 8, 2017 – via Twitter. ^ "PA-18: Jason Kander (D. MO) Helps A Fellow Veteran Pull Off A Big Upset Victory In A Trump District". Daily Kos. March 9, 2018. ^ @JasonKander (June 5, 2017). "My friend @staceyabrams is one of the smartest people I've ever met and I'm so excited to support her bid to be Georgia's next Governor" (Tweet) – via Twitter. ^ "AZ-Sen: Jason Kander (D. MO) Helps Kyrsten Sinema (D) Prevent Sheriff Joe From Becoming Senator Joe". Daily Kos. March 28, 2018. ^ Raasch, Chuck. "Kander raises $2.4 million for his voter-rights group so far", St. Louis Post Dispatch, November 30, 2017. ^ Nitcher, Emily. Not giving up on voter ID push, State Sen. Murante plans to introduce new legislation, Omaha World Herald, December 20, 2017. ^ Nijhawan, Rishabh. Former Senate candidate Jason Kander condemns voter suppression at UC Berkeley event, Daily Californian, December 11, 2017. ^ a b c d e f g h Raasch, Chuck (September 4, 2016). "Blunt, Kander have traditional differences on the issues, and a few notable agreements". St. Louis Post-Dispatch. Retrieved June 15, 2018. ^ Keller, Rudi (April 26, 2016). "Kander uses Senate campaign to bring discussion of student debt to University of Missouri campus". Columbia Daily Tribune. Retrieved June 15, 2018. ^ a b Ventimiglia, Jack (July 29, 2016). "Kander looks ahead to general election, takes shots at leading Republican, Blunt". The Daily Star-Journal. Retrieved June 16, 2018. ^ @JasonKander (August 4, 2018). "Working families in #KC deserve to see their wages go up, not down..." (Tweet) – via Twitter. ^ @JasonKander (August 5, 2018). "Trevor, explain to your friend that the yes campaign is backed by big corporations and the no campaign is backed by workers" (Tweet) – via Twitter. ^ @JasonKander (August 6, 2018). "Frustrating yes. So remind everyone to just vote @NoOnPropA" (Tweet) – via Twitter. ^ Kander, Jason (April 5, 2016). "Op-Ed: Congress must act to stop the BDS movement". JasonKander.com. Retrieved May 26, 2017. ^ Cagle, Ellen (October 6, 2016). "Kander supported Second Amendment while in office". PolitiFact. Retrieved May 25, 2018. ^ "Jason Kander's Ratings and Endorsements - The Voter's Self Defense System". Vote Smart. August 2, 2016. Retrieved November 2, 2016. ^ Spies, Mike (September 16, 2016). "The NRA Is Spending Big on Senate Races in Florida and Missouri". The Trace. Retrieved November 2, 2016. ^ @JasonKander (July 27, 2017). "I've been for a public option since 2009" (Tweet). Retrieved May 25, 2018 – via Twitter. ^ Raasch, Chuck (August 16, 2016). "Clinton emails include one noting McCaskill, others, wary of Obamacare costs". St. Louis Post-Dispatch. Retrieved November 2, 2016. ^ Gounley, Thomas (June 26, 2015). "Area politicians react to gay marriage ruling". Springfield News-Leader. Retrieved June 20, 2018. ^ Murphy, Colin (October 7, 2016). "U.S. Senate Hopeful Jason Kander Talks LGBT Equality". Boom Media. Retrieved June 20, 2018. ^ McDermott, Kevin (February 23, 2016). "Missouri Senate candidate Kander breaks with Obama over Guantanamo Bay closure". St. Louis Post-Dispatch. Retrieved June 15, 2018. ^ Feldman, Anne (July 19, 2016). "Jason Kander Talks Food Labeling, Cuba Policy in Springfield". The Missouri Times. Retrieved June 17, 2018. ^ Greenblatt, Alan (October 1, 2016). "Social Security Looms Over Senate Race". AARP Bulletin. Retrieved June 16, 2018. ^ "UCM SGA presents Kander with Kirkpatrick Excellence in Governance Award". The Daily Star-Journal. April 26, 2018. Retrieved June 20, 2018. ^ "Biography of the Missouri Secretary of State". Missouri Secretary of State. Retrieved October 6, 2015. ^ Newmark, Judith (June 24, 2012). "John Kander brings his memories to Muny's 'Chicago'". St. Louis Post-Dispatch. Retrieved December 2, 2015. ^ @JasonKander (December 16, 2017). "Ever seen this famous old cookbook?" (Tweet) – via Twitter. 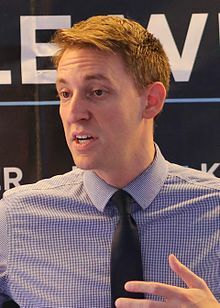 Wikimedia Commons has media related to Jason Kander.